The actor Mimasuya Sukejûrô I held this name from the 11th lunar month of 1709 to the 3rd lunar month of 1725. Dates of birth and death unknown. He started his career as a disciple of Sanjô Kantarô II and his first stage name was Sanjô Kametarô. He made his debut in 1745 at the Moritaza where he performed as an iroko. He became wakaonnagata in 1754. He switched to tachiyaku and took the name of Mimasuya Sukejûrô II in the 11th lunar month of 1767 at the Moritaza, playing the roles of Yoritomo and Morinaga in the kaomise drama "Sanada no Yoichi Banjaku no Iezuto". He played at the Nakamuraza the role of Nitta Yoshihisa and Nagasaki Jirô in the kaomise drama "Ôyoroi Ebidô Shinozuka". This was most likely his last appearance on stage. No record afterwards. 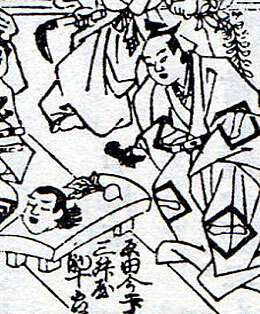 His ranking in the 1773 Edo hyôbanki, tachiyaku section, was two white strokes above jô-jô [visual]. 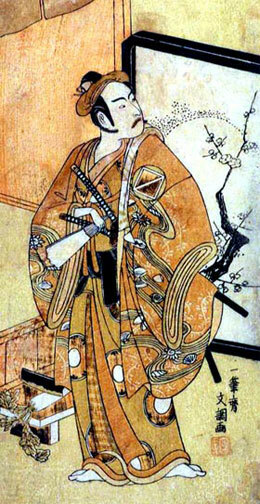 He was said to be good in wagoto, jitsugoto and kyôkaku roles.